I took a few evenings over the past few weeks to re-read several books that I first read in my mid-teen years. 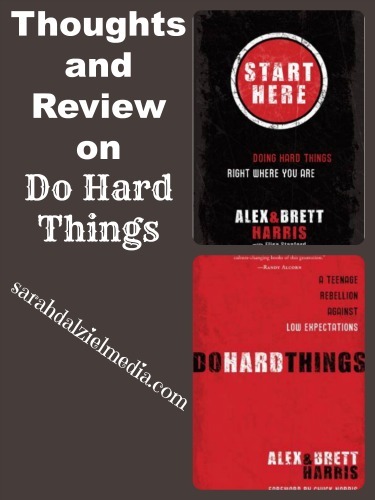 Those books were “Do Hard Things” and “Start Here” by Alex and Brett Harris, two awesome books by two homeschooled teens who started with an idea, and a blog. That idea was that the teen years were more than they seemed, and the blog was the Rebelution. While I am no longer a teen, but a young adult, the ideas, challenges, and perspective offered in these two books is still invaluable. “Do Hard Things” was first read, in my house, as a family study around the dinner table. I was about 15 at the time, and sometimes wondered what “hard thing” a rural farm kid could get herself into. After all, it’s not like I had a bible study to lead at my school, or had the ability to start a fundraiser for schools somewhere. And so, I ended up dismissing and forgetting about the book, until last year. Before I went to Israel, I wanted to re-read “Do Hard Things” but could not locate it on our over-stuffed bookshelves. So, instead of re-reading it, I finished preparing for my trip and went to Israel and didn’t think of the book again until I suddenly spied it last week. It’s red and black cover suddenly stood out to me, and it looked lonely, like it wanted to be read and appreciated again. So, I re-read it and its sister book “Start Here.” But, re-reading it made me discouraged. After all, I am no longer a teen. And I haven’t been doing any “hard things” at least, not like all those other teens the book talks about. Since I first read “Do Hard Things” in highschool, I have done several “hard things” of various difficulty levels. Getting a University degree without debt and 100% by distance learning. Stepping out and working at the local Bible Camp when I did not want to work with “other people’s little brats” (I did change my mind on that one, before I started there. But that was my perspective the year before when it was suggested). Learning how to write, and write fast and well. I was the 13 year old who hated book reports, but loved reading. I was the 17 year old who procrastinated for a month on her last English essay. And I was the first year university student who realized I could either learn to write, or epically fail all my courses. So, not only did I learn to write, but I learned to write both fiction and non-fiction fast and well. Now I’m the person who can write most of the day, and hit anywhere from 4-10 thousand words in a single day. I wrote and published a novel, and am working on the sequels for that novel. Now, I still have several steps to finish with my first book (back cover creation, and print edition copy-editing, but it is nearly finished. I went to Israel, not once but twice when I didn’t know anyone. While the first time was a tour, the second one was a much harder “thing” since I had to live on my own, function in a strange culture, and was volunteering full time. But it was lots of fun once I got over the freak-out my first day. And, that was again without debt. That’s five “hard things” I’ve done in just about 7 years, and many of them took more than one year to accomplish. Now, looking around I have several more “hard things” that I am working on, including more novels, some short stories, and going back to Israel for a two year volunteer commitment. And possibly the hardest thing will be avoiding debt while I am doing it all, but the novels should help with that. I realize that, even without the reading reminder of “Do Hard Things” that doing those things can become a lifestyle. While I’m not seeking out things just because they are hard (okay, I want to try bouldering because it looks fun, even if it will probably be impossible for me). I am, unconsciously or not, forming habits and thought patterns that will enable me to do and accomplish more challenging things than might otherwise be expected. For me now, it is not the writing, but the consistency that is a challenge. It is not putting words on a page, but remembering to do the editing that is a hard thing. I realize that as one grows and matures, what was once hard becomes the new “normal” and your comfort zone shifts. My first trip to Israel was hard, I wasn’t sure I even wanted to travel alone, let alone for 15+ hours straight! For my second trip, the flights were easy, but it was transferring to living on my own that was the biggest challenge. When I go back, it will be continuing to craft my own writing, and developing habits that enable that, while volunteering as a full time writer. Whether you are an adult, a teen, or a young adult, what do you think about doing “hard things” in your life? If you haven’t read either Do Hard Things, or Start Here, would you think about it? If you have read them, what did you think of them and how did they impact your perspectives?